Did you know that your subconscious mind contains a limitless supply of creativity, powerful stored information, and a vast amount of untapped potential? • The ability to heal yourself from the inside out? • A greater sense of empathy & understanding for others? • Remember everything in greater detail? • Super-easy access to life solutions? • Creative abilities you never dreamed possible? • Dramatically enhanced learning abilities? • An understanding of the root of your fears & phobias? • Clarity of thought at all times? What's the very best way to reach my subconscious mind so that I can access these benefits? Meditation. Merging the state of mind you are currently in, your conscious mind, with the power of your subconscious mind, where these limitless benefits reside, meditation is the key. 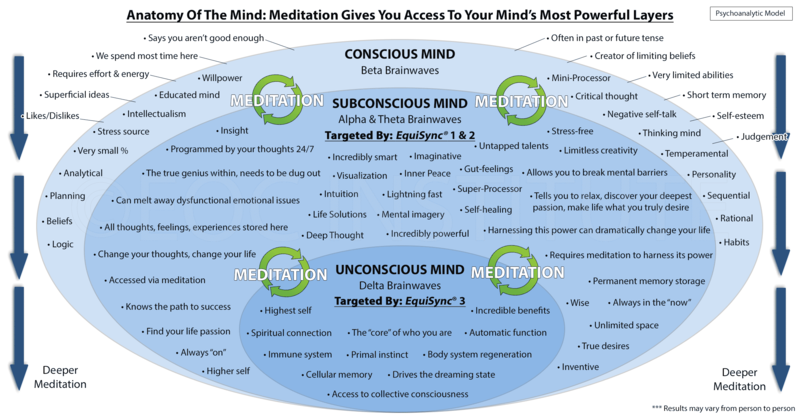 You can use the infographic/ chart below to better understand the various benefits associated with your subconscious/ unconscious mind, and how meditation is the key to harnessing this incredible power. Tip: EquiSync® targets the brainwaves of the subconscious/ unconscious mind levels (Alpha, Theta, Delta) via a super safe & highly effective sound technology. You are invited to learn more about how it works on the website.